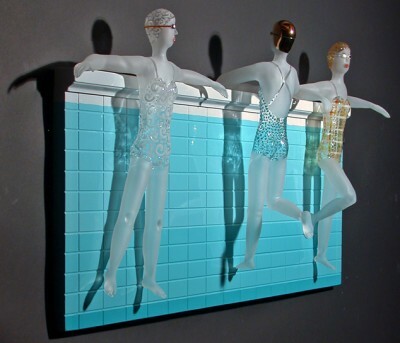 I want to thank Daily Art Muse for presenting Karen Buhler’s glass figures. They’re the perfect combination of sophistication and whimsy. She uses borosilicate glass to shape the hollow figures depicting swimmers and divers with a feeling that comes from Art Nouveau influences. She started working in glass back in 1980 and focused on sculpting with borosilicate tubing in 1998. She finds it slows down the process and gives her more control. Over at her web site you can see some of her other work. I especially like the busts in the shadow boxes. Thanks for the info. I’ve fixed the article.